Tallinn. We love love love you!!! 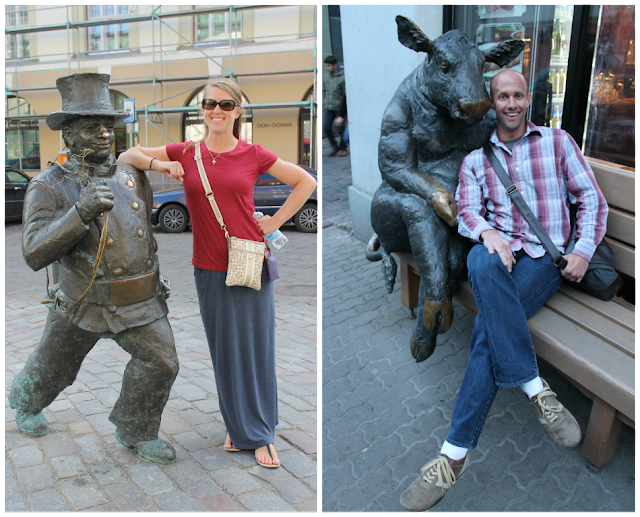 If you remember from last year, Luke and I went to Stockholm, and we fell in love. Who knew there could possibly be somewhere better than Stockholm? I honestly don't know which to choose as my favorite though, so please don't make me decide! Let's back up a bit though... Tallinn is known for several things: a small old town with a partially erect old town wall, the former headquarters of the KGB, and the birthplace of Skype. But what really put Tallinn most on the map is inexpensive booze. Years ago, the folks over in Finland would hop aboard the morning ferry, make a journey across the waters to get drunk on the cheap as well as stock up on booze, then bring it all back to their homeland. It's not as much the case these days, but Tallinn is still a grand place to visit! 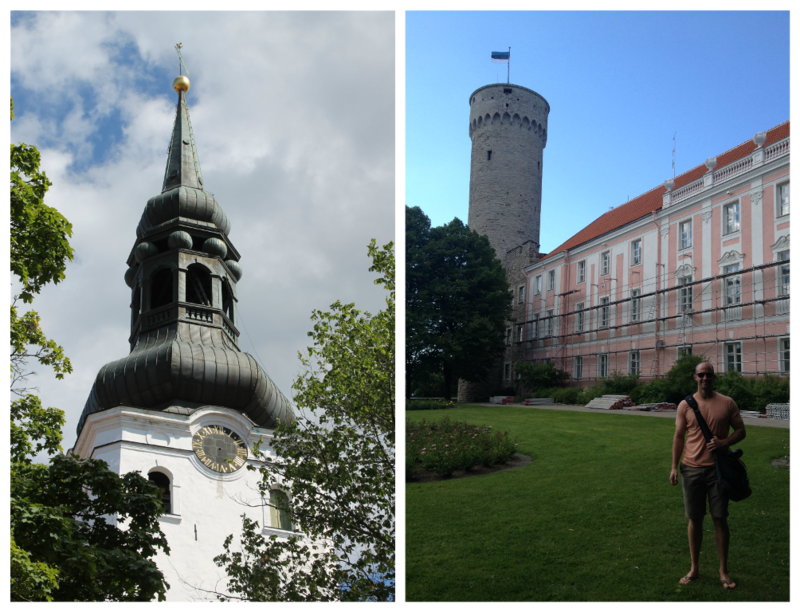 We followed the crowd and hopped on the morning ferry to Tallinn to stay for two nights. We sailed away from Helsinki at 10:20am. We were able to quickly find seats on the back of the boat where we got amazing views of the Port of Helsinki. As we sat down waiting for the boat to depart, the line at the bar grew longer and longer by the second. At 10:30am, it was apparently party time! Eventually we joined the bar queue and sipped our drinks for two hours as we journeyed across the sunny waters. The entire time I kept thinking it felt like a cruise except it was cold. 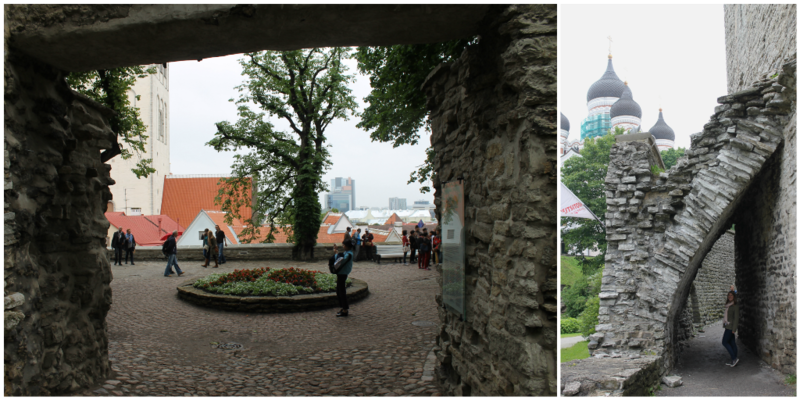 Arriving to Tallinn was really fun because we got to see the city getting closer and closer with a different view than we usually see of a city. One of the first things we noticed arriving and walking into the old town was how many steeples and towers stood above the rooftops. 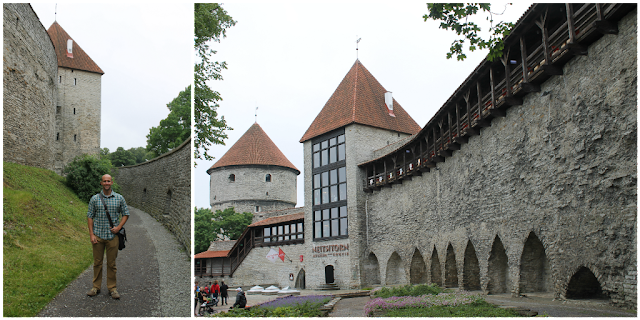 Within minutes, we knew Tallinn was a special place! We dropped our bags at the hotel and immediately set off to enjoy the perfect weather. I was and still am in shock of how few people were roaming the streets on such a beautiful Saturday. In the UK, people are everywhere on a sunny Saturday! We walked along the old town wall, snapping way more pictures than needed. We headed to castle hill where several main attractions sit. This place is just amazing! We wandered back down the hill toward the main square. It hadn't even been five hours since we arrived in the town, and we were almost halfway thru walking each little street! haha! 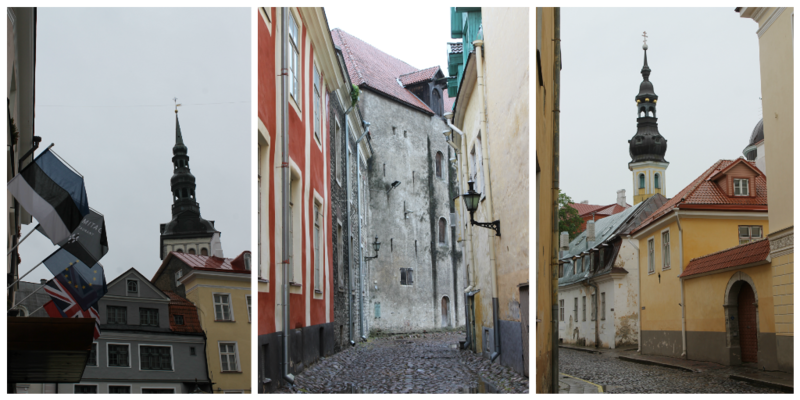 One of my most favorite things about Tallinn were the streets. These were some truly old cobblestones. They were very uneven - I cant imagine driving a vehicle or riding a bike around. Some streets had bricks replaced in only the center, but the edges looked like original rocks rather than bricks. It wasn't very easy to walk on even with good shoes. I should have banned Luke from picking a place to eat after our Helsinki Mexican food fiasco, but I allowed him to choose dinner again. We ended up at the absolute biggest tourist trap of a restaurant possible! Hah! It was super quirky with medieval decor and costumes,. The food wasn't too bad, but the beer - ick! They only had two choices - honey and herb - and neither were very good! 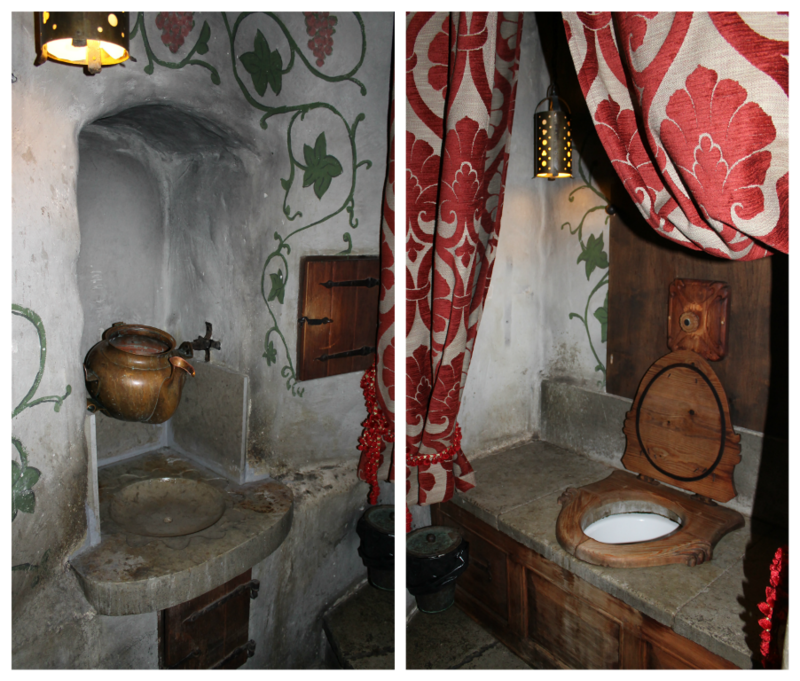 Besides all of that, the bathroom was hilarious! Yes, I took pictures because it was totally themed out! Luke had to help me wash my hands in the basin. Moving along, we continued to enjoy the town, wandering down little alleys, stopping at a few bars, and taking advantage of being in a place neither of us even knew existed a few years prior! Sunday was a complete 180 from Saturday as far as weather goes. It was raining and cloudy and two jackets were necessary! We purposely repeated some pictures from the day before to see how weather can change the view. 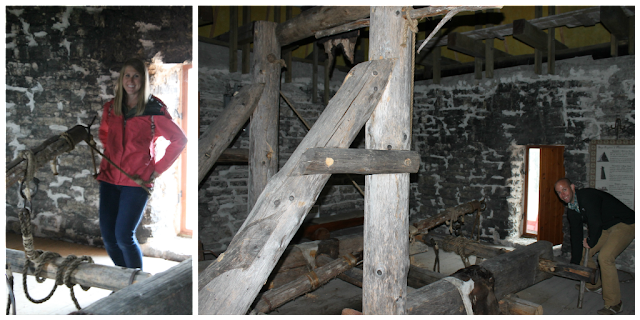 Luke and and I decided to go up one of the old town wall towers. 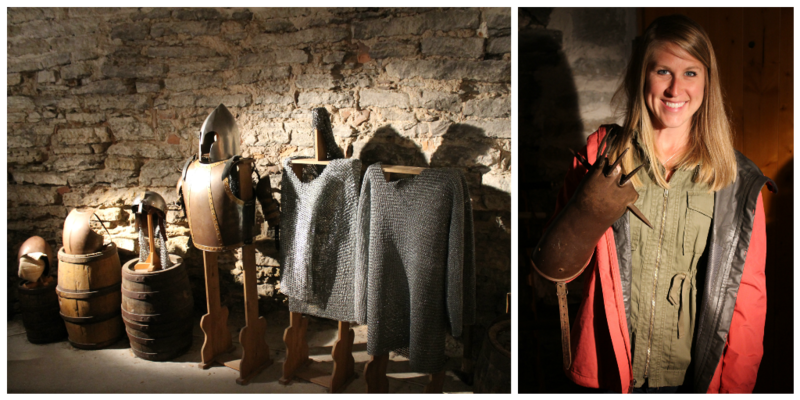 This one was full of medieval gear, and we could try everything on if we wanted! Despite the dreary weather, Tallinn was still every bit of charming! A popular attraction of the old town is St. Catherine's Passage, which dates back to the 15th century. It is somewhat hidden and we actually didn't even notice it the day before. Next on our agenda was to walk on top of the town wall. 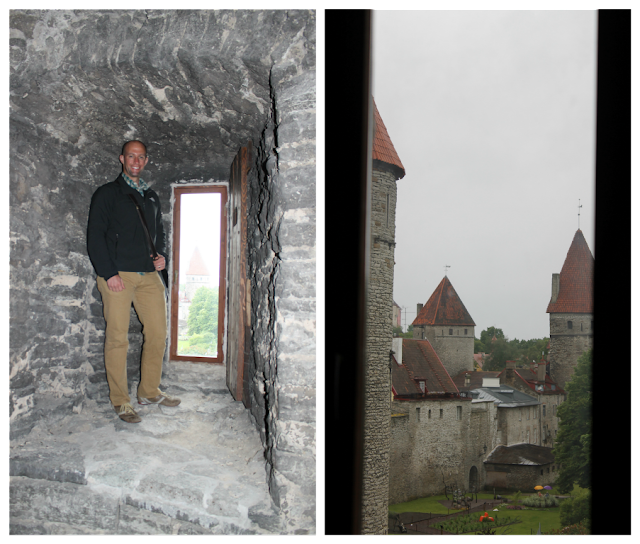 Most of the tourist attractions are fairly cheap, which is wonderful for a rainy day! As we walked around, we noticed two things about Tallinn. 1.) It was full of American kids studying abroad! Seriously, they were so loud and obnoxious. It may sound terrible for me to say that, but one of them yelled, "My dad is rich!" Um, okay?, and 2.) It was much busier outside of the old town wall than inside. I guess only tourists hang out in the Old Town. We ventured out of the Old Town to visit the former KGB Headquarters, which was located in a hotel. 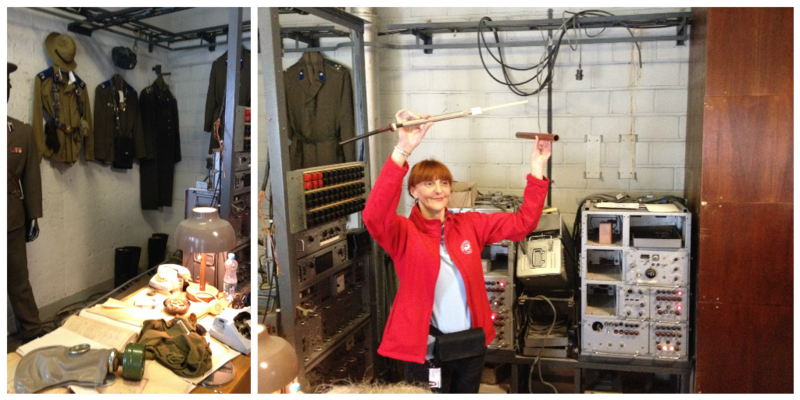 Our guide, who worked in the hotel at the time when the headquarters were in operation, took us and a good amount of other people to the secret area where the KGB ran business back in the day. It was very interesting to learn just how much spying went on and what devices were used to listen and watch people. Creepy! To this day, the hotel workers still don't know who worked in the KGB offices as it was 100% top secret. We were able to get some wonderful views from the hotel after our tour was finished. We walked around a bit more after our tour. For dinner that night, we had made a reservation to eat at Vanaema Juures ("Grandma's Place") which was very good. 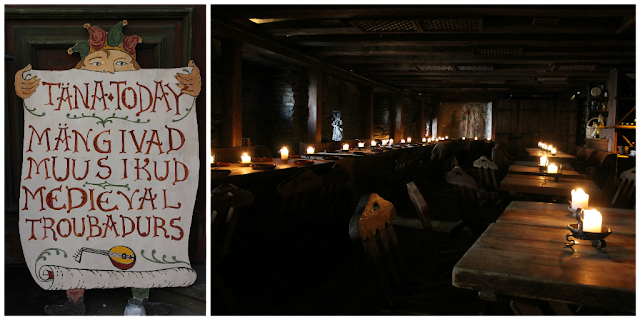 I'm glad we made a reservation, and that I got to choose this one! We had more thing we wanted to do in Tallinn before we said good bye and that was to climb the tallest tower in the city - Oleviste Church. When we woke up on Monday and walked outside, bam! Heavy fog! Totally, not the best weather for a viewing platform. We said vetoed that idea and decided to just take our bags with us for the day rather than leave them at the hotel. 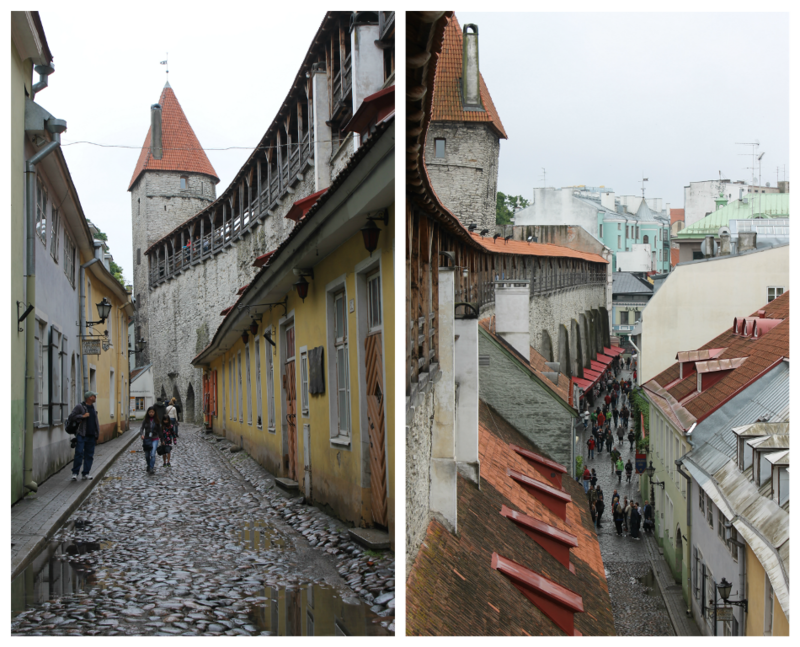 A large group of people from a cruise ship that just rolled in, were making their way into the Old Town, so we ended up walking the loop around the outside of the old town wall seeing various other things before making our way to the bus stop to head to the airport. 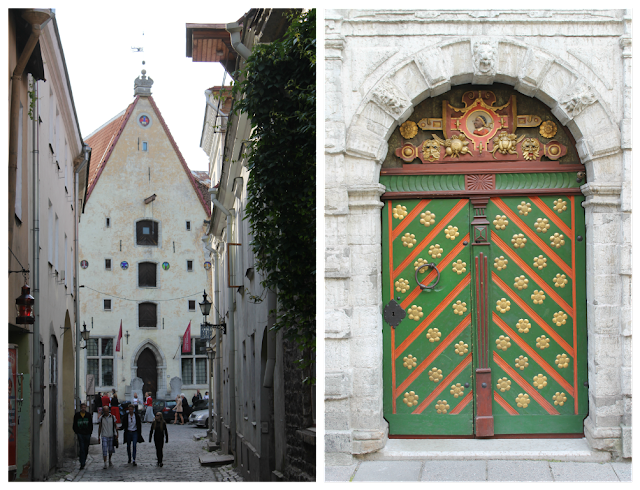 I think I have made it pretty obvious that Tallinn is an amazing little place! I would love to go back, but some things are better to be left with happy memories, and I am thinking it is best if I leave it be. Full credit goes to Luke on this one as he was the one who wanted to go here in the first place. Thanks hubs!! 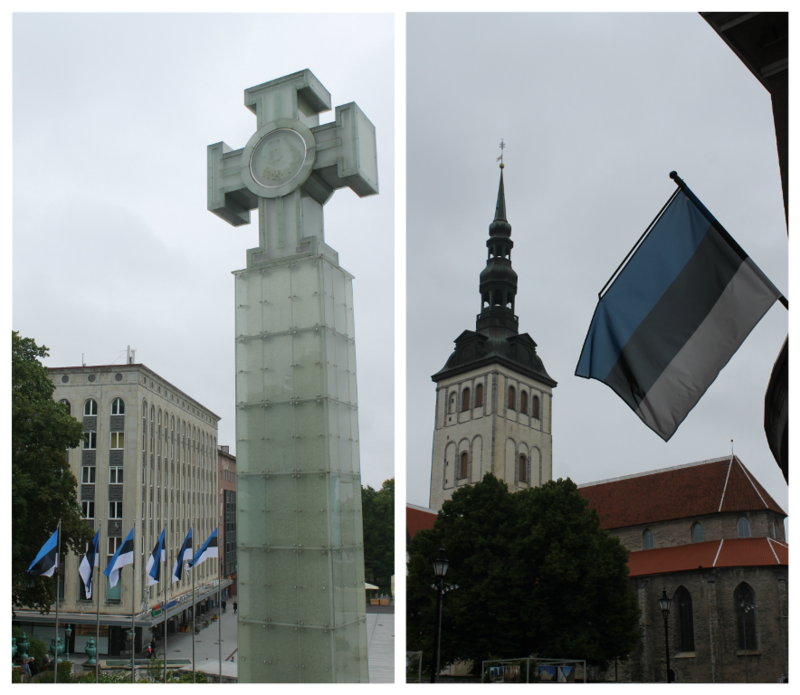 Estonia joined the European Union in 2004, and now uses the euro as its currency. Tallinn (as well as Helsinki) is fairly tech-savy and credit cards are more acceptable to use rather than cash. eToro is the best forex trading platform for rookie and professional traders. Aberdeen, Scotland - My Third "Visit"